This time last year, the AGM Steering Committee was relaxing over tea and scones in our fearless leader’s living room, frowning at budget items and relishing the prospect of sharing Texas with the Jane Austen Society of North America. This year finds that same group seated around an enormous conference table at The Worthington Hotel in Ft. Worth, talking through the entire five-day conference, visualizing the event in our heads so that we can anticipate every possible problem and generate solutions now. Last year we talked about programs, prizes, and font size. This year we’re focused on extension cords, power strips, and duct tape. Sample Problem: Where will we store the fresh English ivy to be used in table decorations on Sunday morning? The AGM Coordinator flew in from Milwaukee to assist, experts on audio/visual and other technical issues weighed in, and a hotel representative testified precisely on tables and room sizes. It felt more like a Senate Hearing than a gathering of Janeites. The room where the Author Book Signing will occur is vast–just about right for a Texas-sized Literary Event, and we can’t wait to fill it with authors, tables, chairs, and and every sort of Jane Austen-related book. All visitors will receive a map, and lots of volunteer helpers will be present to to make sure no one gets lost during the event. I’m standing at the other end of the room in the picture at the right, but the distance is so great, I’m unrecognizable. The Author Book Signing will feature familiar Austen Authors: Abigail Reynolds, Sharon Lathan, C. Allyn Pierson, Mary Simonsen, Karen Doornebos, Diana Birchall, and Cindy Jones. Also present will be editor Laurel Ann Nattress and many of the authors contributing to her brand new anthology, Jane Austen Made Me Do It, including Syrie James, Beth Pattillo, Pam Aidan, Margaret Sullivan, Janet Mullany, and Carrie Bebris. For more information about the event and a complete listing of participating authors, check the website. For more information about The Jane AustenSociety of North America (JASNA), and to find a chapter near you, check this website. Secrets were revealed during our meeting! I learned several amazing things and I’ll share one now: Guess who’s coming to the AGM? The BBC film crew! The British Broadcasting Corporation will be filming interviews with AGM attendees during the conference for use in a documentary about You Know Who. But that’s not the only secret that was revealed at our meeting. Over the next few weeks I’ll be sharing updates on Austen Authors’ Facebook Page, and during the course of that time, I’ll reveal two more secrets! 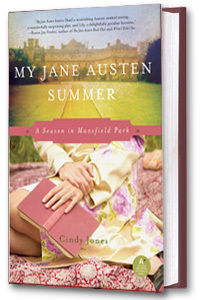 This entry was posted in Austen Authors, Cindy Jones, Jane Austen, JASNA AGM, My Jane Austen Summer. Bookmark the permalink. We’re Having a Bilingual Baby Shower! Should I Laugh in the Face of Rejection?